Muziek Expres was one of the oldest pop music magazines in the Netherlands. It already existed as of 1956. Until the mid 70s it was by far the biggest Dutch music magazine. The last (monthly) edition was released in December 1989. 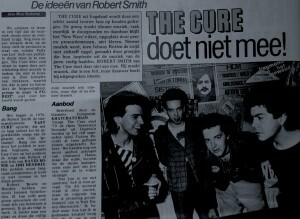 In August 1980, The Cure got their (if I’m right) first feature article in Muziek Expres. Interestingly, it was an interview with Lol. 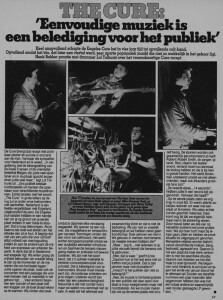 He talks about the Dutch, doing concerts and the making of the Seventeen Seconds LP. Below you can read a translation of this article by Henk Bakker. On Sunday 29 July 1979, The Cure played their first ever gig abroad. It took place at the ‘Sterren in het bos’ (‘Stars in the forest’) Festival in Groningen, a city in the Northeast of the Netherlands. The Sterren in het bos festivals were organised in the ‘Sterrebos’ park on Sundays during the summers of the seventies up until 1983. It was free entrance. On most editions a couple of thousand visitors would turn up. In those days there was still quite a hippie-like atmosphere. Other bands that have played at the Sterren in het bos festival series include Fischer Z (1979), Echo & the Bunnymen (1980), The Sound (1981) and Comsat Angels (1982). The Cure’s performance was in the afternoon. It’s probably mostly remembered due to a cloud-burst, transforming the park into a lake. At least two other local bands played that day: Suster Poppy and Plant. In the evening The Cure would do another show at a small club called Simplon, also in Groningen, perhaps to make it up for their soaked Groningen fans. The Cure spent quite some time around Ascension 1984, at the end of May and the beginning of June, in the Netherlands. It was the week in which Robert Smith was on the verge of a mental breakdown, forcing him to cancel the upcoming tour with Siouxsie & the Banshees and to take a break away from The Cure. Despite his state of mind, Robert delivered three powerful shows with The Cure in the Netherlands, with two of them on one day (! ), and did a promo performance of the new single The Caterpillar for Dutch national TV. To understand what was going on that week, I think you would have to look back at about a year and a half before. 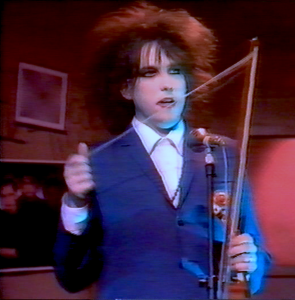 Since the last quarter of 1982, Robert Smith had been working non-stop with three bands. Next to The Cure, he became a guitarist with Siouxsie & the Banshees, recorded the hit single Dear Prudence with them, the live double LP/video Nocturne and their new studio album Hyaena. They had toured the UK and Europe in Autumn 1982, then Japan, New Zealand, Australia, some European festivals and Israel in 1983 and Europe again at the start of 1984. In the meantime, Robert had also formed a side project with Banshees-bassist Steven Severin called The Glove and recorded the album Blue Sunshine, released in August 1983. On top of it all, he kept The Cure going. Robert and Lol had recorded a string of singles with accompanying videos, did some shows as a four piece in the UK and the USA in the Summer of 1983 and then toured the UK and Europe again in Spring 1984. In addition, Robert had written and recorded the new Cure LP The Top, which was pretty much a solo effort. He had also helped out video director Tim Pope with his single I Want To Be A Tree. One can imagine he couldn’t carry on like this. 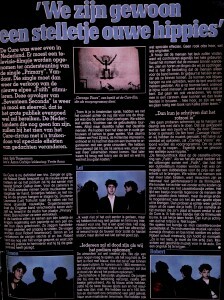 In July 1981 the Dutch pop magazine Muziek Expres published an interview with The Cure, which was probably taken sometime in April or May 1981. The Cure were on a flying visit to Holland to record a mime TV performance for the new single Primary. I guess this has to be the Star Club performance, which was on YouTube for some years. The interview focuses on the upcoming tour, which was going to be the famous circus tent tour (exclusively for the Netherlands) during the last ten days of June 1981. Below is the literal English translation of the original Dutch text written by Erik Timmerman. The ‘Hitkrant’ is a Dutch pop music magazine, which already exists as of 1977. It is targeted at teenagers between 12 and 16 years old. 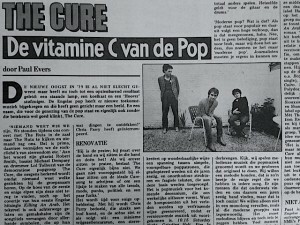 In August 1980, Hitkrant published a small article about The Cure. As far as I know, it is the first publication about the band in this magazine. Since then, several articles followed, not all of them being very serious. The reliability of the contents of the August 1980 article can be questioned as well. Below is the literal English translation of the Dutch text.